Join 16 local breweries and a half dozen food vendors for a cozy winter evening inside the Santa Fe Farmers Market hall. 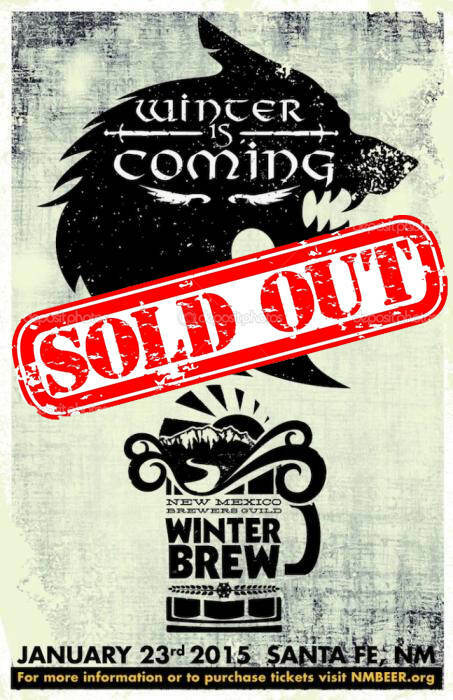 NM Brewers Guild welcomes two new breweries - Red Door Brewing, Ponderosa Brewing and Boxing Bear from ABQ - to WinterBrew along with returning local favorites Abbey, Taos Mesa, La Cumbre, Marble, Second Street, Sierra Blanca/Rio Grande, Santa Fe, Bosque, Blue Corn, Duel, Roosevelt, Blue Heron, Turtle Mountain and Tractor. Entry to the fesitval includes a commemorative pint for sampling from over 60 beers on tap. It also includes one ticket valid for a full pint of your choosing. Addition pints can be purchased from the breweries and food will also be available ranging from $2 to $8 per plate. Food vendors include Second Street Brewery, Blue Corn Brewery, Santa Fe Cluniary Academy and Bambini Philly Cheese Steaks. 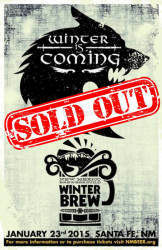 Tickets for WinterBrew 2014 sold out one week prior to the event, only a handful remain so grab them quickly.